Purchase a bottle of First Sighting wine between 1 and 28 February 2017, complete the entry form in store and stand a chance to win a weekend for four people or week for two people at the Strandveld Vineyard cottages, including a wine tasting and 12 bottles of First Sighting wine. 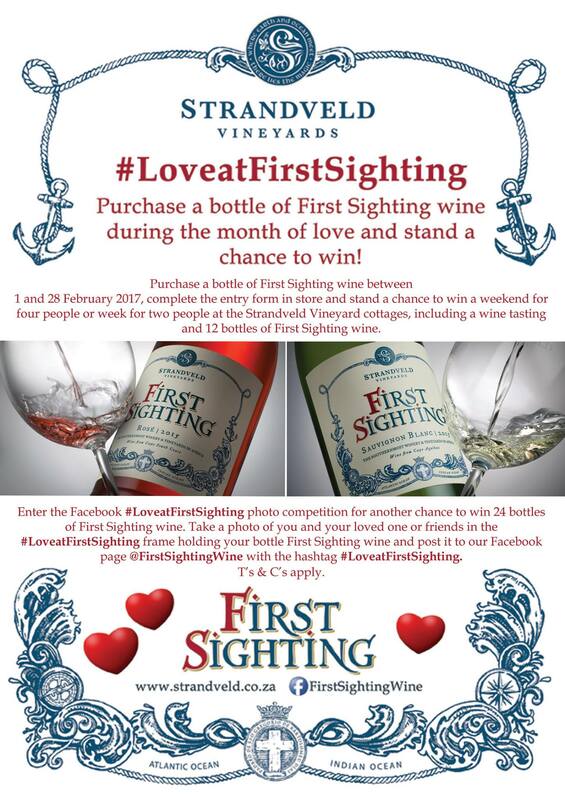 Enter the Facebook #LoveatFirstSighting photo competition for another chance to win 24 bottles of First Sighting wine. Take a photo of you and your loved one or friends in the #LoveatFirstSighting frame holding your bottle of First Sighting wine and post it to our Facebook page @FirstSightingWine with the hashtag #LoveatFirstSighting.